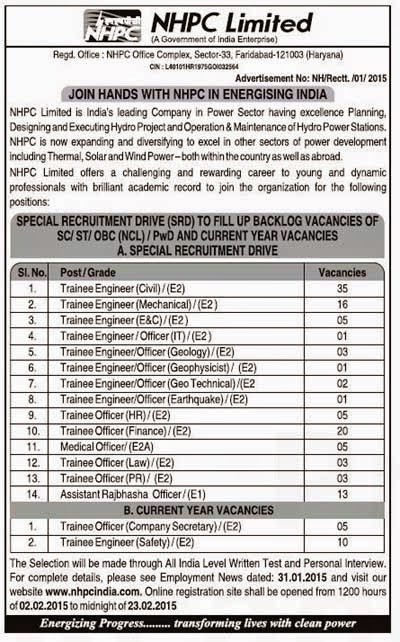 NHPC Limited (National Hydroelectric Power Corporation) Special Recruitment Drive (SRD) to fill up Backlog Engineers vacancies of SC / ST / OBC (NCL) / PWD and Current Year Vacancies. How To Apply: Eligible Candidates Apply Online. Online Registration will be open from 02/02/2015 at 12:00 Hours and end on 23/02/2015 Midnight. For complete details, please see Employment News dated: 31/01/2015 and Visit NHPC Website www.nhpcindia.com.